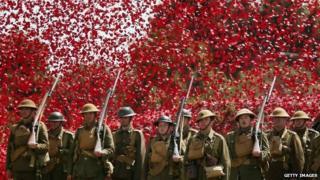 More than one million poppies were blown into the air in Dorset to mark every Commonwealth death during World War One. The release of 1.1m poppies from a tank - described as a "poppy explosion" - took place at Bovington Tank Museum. The museum also staged a mock battle with replicas of a British Mark IV tank and a German tank. The activities were among the events taking place to commemorate the centenary of Britain joining the war. Other memorial activities in Dorset included a digital light work by artist Martin Coyne in Poole. It was at the war memorial in Poole Park from 22:00 to 23:00 BST. Borough of Poole Council said Mr Coyne's work turned Poole's war memorial into a "living reliquary", animated with voices, poetry, memories, pictures and film. Poole residents were invited to attend and participated by reciting poems and literature specific to the war. A wreath laying took place in Wimborne to remember those from the town who died in conflict and a candle-lit commemoration took place at the war memorial in Bournemouth between 22:00 and 23:00. There were also readings, poetry and music in Bournemouth, and the lights of the town hall were turned out.